A major visitor attraction company wanted to create an engaging, interactive and inspiring conference for 300 of its employees across its brands. The conference aims focused on increasing value within the business and delivering excellent customer service. 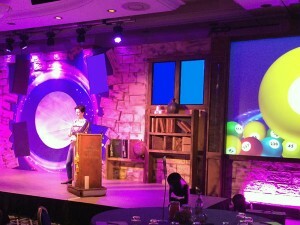 The three day event held at Alton Towers needed to inspire and motivate employees. Organisers wanted to give their employees a memorable experience and provide them with all the conference materials they needed using the latest technology. All at the touch of a button. company’s logo and corporate identity. Organisers wanted the large number of delegates to be processed in an efficient and manageable way. To assist staff, a registration desk was placed outside the conference room where each delegate was provided with their own personalised RFID Smart Badge upon arrival. Their attendance was then instantly registered by simply swiping the badge over the NFC reader on a Smart Device at the registration desk. Delegates were encouraged to send in their ideas, comments and suggestions for improving the business strategy throughout the event. 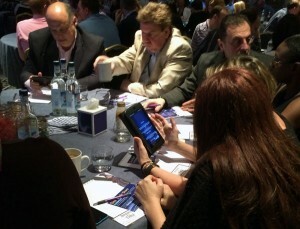 Using another tablet and the Message Gateway, organisers could see audience feedback in real time and select messages to be displayed live on the main screen. Individuals were also able to send in their questions to the guest speakers using the tablets for a further panel discussion, with the option to do so anonymously. 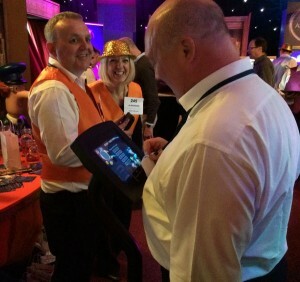 Using our Smart Kiosks, ten information points were set up around the venue to inform delegates about the different departments within the business. Employees were encouraged to visit each stand and rate how informative each was on a scale of 1-10 (10 being excellent). The scores were then sent to organisers for analysis. Exhibitors were encouraged to get as many delegates to rate their stand, as the department receiving the most points was eligible for a cash prize. In the main conference session, amongst an array of brightly coloured lights, delegates were treated to a programme of inspiring speakers, musicians and fun activities. Adding to the fun of the first day, delegates were led out of the conference room by fairground staff and dared to ride The Smiler – the world’s first 14 looping rollercoaster, complete with optical illusions. 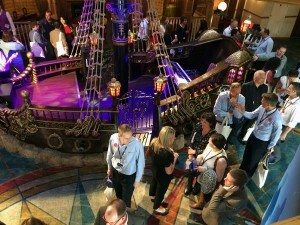 The conference was rounded off with a gala dinner; hosts were keen to ensure that delegates were able to find their seat quickly, efficiently and with a minimum of fuss. 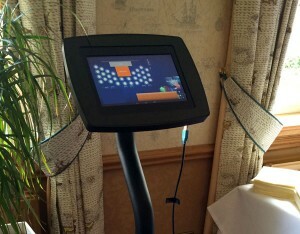 We provided an easy to follow interactive floor plan on free standing Smart Kiosks placed outside the conference room. 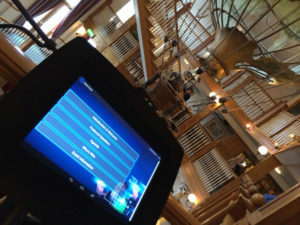 Delegates could find out exactly which table they were sitting on and where that table was located on the plan by swiping their badge over the NFC reader on the kiosk. Event organisers wanted employees to leave the conference feeling inspired, motivated and ready for the new business challenges that awaited them. Delegates benefited from having readily available conference materials and just how easy it was to use the tablets and Smart badges. Results showed that hundreds of comments, questions and messages were sent by delegates over the course of the three days, with the winning exhibition stand receiving 1,527 points, showing just how engaged delegates were throughout the event. Our client approached us with the challenge of providing a fully ‘paperless event’ and Group Dynamics was the obvious solution. Their team worked closely with us throughout the whole project. In the lead up to the event we were provided with original ideas to put forward to our client with intelligent thinking and good planning. All this followed by a first class deployment of equipment and staff on site culminating in a fully immersive experience for the delegates that engaged and informed. Thank you very much Group Dynamics, we look forward to working with you again.